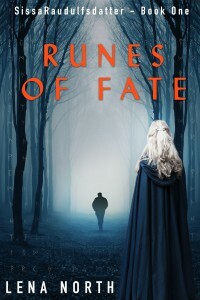 In Runes of Fate, we meet Sissa, daughter of thralls, of slaves, who’s always been good at figuring things out. It starts on the evening she’s supposed to be sacrificed to the gods. When they find out that someone else is killed instead, Sissa fights to find out who the murdered is, even when it threatens to destroy dreams she’s nourished for a long time. Shards of Love will be book two in the series, planned for 2018.